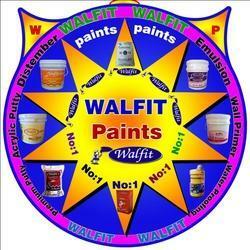 Walfit Paint & Chemical Products has made a long way since its modest beginning in 1998. We started our business operations in the beautiful city of Chennai which is capital of state Tamil Nadu, India. Our firm is a premier company engaged in manufacturing and supplying Water Based Cement Primers, Water Proofing Material, Acrylic Emulsion Paints, Wall Putty and many more. We are in the industry to build up a long time ethical business relations with all our clients. We are manufacturing products which are of high utility value both for exterior and interior of buildings. Our products are made keeping in mind not only the looks, but they also help in strengthening already built structures even further. We use best raw material in our manufacturing to garner excellence in our range. Walfit Paint & Chemical Products has been able to establish a good foothold in the market due to sincere efforts of Mr. V.Thavasi Anantham (Proprietor), who have worked very hard to ensure the firm to earn this feat. They have an extensive knowledge of the product range and also of the entire manufacturing process of the products. People get mesmerized when they see buildings coated with our Interior & Exterior Emulsions, Washable Acrylic Distempers. We make full use of different vibrant colours in our manufacturing so that they give an elegant and spectacular look to the buildings. Our focus is not only on the looks but our products have proved their worth as they provide excellent protection to buildings in high rainfall, heat and cold and humidity, our products also give great protection against dust accumulation. All this has been possible because we use best quality raw material in our manufacturing which makes clients overwhelmed. All our products get sourced from certified vendors with whom we have established contacts for past many years. We are a client centric firm and we wish to reach out to maximum number of customers and give them an experience which ensures a perfect value for their money. We have an excellent distribution network system which has always been very effective in meeting client’s requirements. We ship our products by road through our reliable transporters who have always delivered goods within deadlines. Our products are thoroughly checked before the final dispatch and henceforth, assure high efficiency and durability. Bulk orders are completed effectively within the given time slots to bring worth to the clients' money. In today’s stiff completion, any company can only think of growth, only if it has the grit to deliver quality products in the market. Clients prefer us because we provide them products which are excellent in quality, our every endevour at Walfit Paint & Chemical Products is to ensure quality. Our quality team is very proficient in their job and they make every possible effort in this direction, they assess quality of raw material on different parameters and also keep a check on different stages of manufacturing at various levels. Our product tested & certified by the Govt Lab as per IS Specifications (IS 8042 ans IS 269). Our entire business operation right from manufacturing till delivery of products is focused on clients satisfaction, all our efforts are to ensure a delightful experience for clients whether it is manufacturing, quality, product delivery or any thing else. We deliver to fail if our clients are not happy with us, all our products come with the instructions regarding their usage this proves to be great help for customers as it is educating and they also come to know the application of product by technician is done in right manner.